BBC creative director Alan Yentob has said he would not rule out Jeremy Clarkson making a return to the BBC in the future. "Of course I wouldn't rule that out, but that's not for now," he told the BBC's Newsnight. 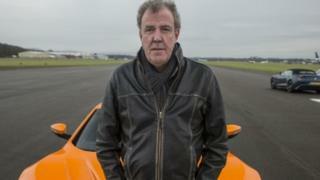 Yentob said the decision to drop Clarkson as a presenter of Top Gear was right, but also a sad day for the BBC. He said it would be a disappointment if the other presenters quit, but the programme might still continue. Jeremy Clarkson, Richard Hammond and James May have worked together on Top Gear since 2003. The BBC has so far not commented on the future of Hammond and May. Yentob acknowledged it was "perfectly natural" for the presenters to have reservations about continuing on the BBC Two show: "They are a team - they have worked together for a very long time, they are all very attached. "The question of what happens next for Top Gear is a conversation which must go on between the controller of BBC Two Kim Shillinglaw, between Andy [Wilman - producer of Top Gear], and the team." On Wednesday, Hammond tweeted: "Gutted at such a sad end to an era. We're all three of us idiots in our different ways but it's been an incredible ride together." May also appeared to suggest he was contemplating his own departure, telling Sky News: "I'm sure Top Gear can continue in some way. It existed before us and has been reformatted several times." On Wednesday it was announced the presenter's contract would not be renewed. An internal investigation, led by Ken MacQuarrie, the director of BBC Scotland, found that Mr Tymon took himself to hospital after he was subject to an "unprovoked physical and verbal attack". North Yorkshire Police are also looking into the incident, which took place at a local hotel. "We have a duty to investigate where we believe an offence might have been committed, and that is what we have been doing with this case," a spokesperson said. "As is usual in these circumstances, we have made contact with Mr Tymon through his lawyers, to ask him to speak to us so we can ascertain how he wishes to pursue this matter." "When these routine enquiries are completed, we will be able to assess whether or not further action needs to be taken from a police perspective." Speaking to reporters outside his home on Thursday, Clarkson refused to answer when asked if he was worried about a potential arrest. Instead, he said: "All I would like to say is... I wish people would leave Ois [Oisin Tymon] alone because none of this was his fault."